School of Biochemical Engineering 1, Indian Institute of Technology, Banaras Hindu University, Varanasi - 221005, Uttar Pradesh, India. Chemistry Section 2, Mahila Maha Vidyalaya, Banaras Hindu University, Varanasi - 221005, Uttar Pradesh, India. ABSTRACT: Bimetallic nanoparticles have several useful opto-electronic and catalytic properties that are different from those of monometallic nanoparticles. The development of non-toxic and eco-friendly protocols for the synthesis of bimetallic nanoparticles is a still less explored area. In the present study, bimetallic silver-gold nanoparticles were synthesized using Trichoderma reesei (NCIM 992). An effective approach for co-reduction of metal salts was adopted wherein the fungal biomass was grown under non-limiting conditions, followed by the addition of metal salts. The bio fabricated bimetallic nanoparticles were characterized using UV-Vis Spectroscopy, ICP-MS, SEM equipped with an EDS, FTIR and XRD. The fungal biomass color changed from colorless to dark purple within 2 days of incubation period. 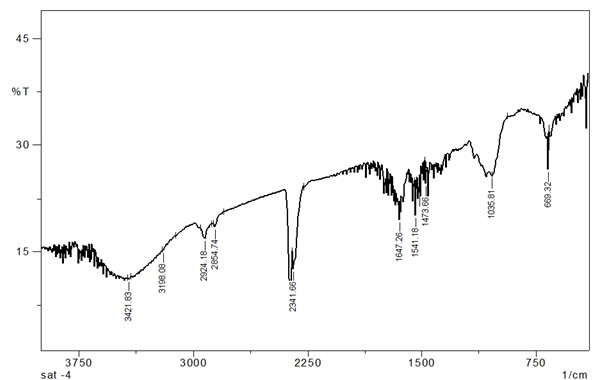 UV-Visible spectrum of the intracellularly produced bimetallic nanoparticles showed characteristic peak between 420 nm and 540 nm. ICP-MS of the residual salt concentration depicted the percentage of bioconversion of metal salts to metal nanoparticles. 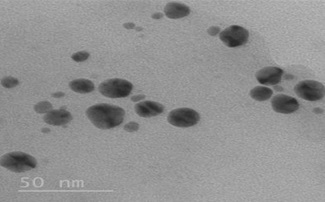 SEM-EDS studies confirmed the presence of intracellular silver-gold bimetallic nanoparticles. FT-IR analysis revealed the existence of peaks in the amide regions, a characteristic of chemical functional groups that are responsible for the reduction of metal ions and nanoparticles stabilization. XRD results determined that the nanoparticles ranged between 25 - 40 nm in size and were crystalline in nature with the face centered cubic symmetry. The synergistic oligodynamic effect of bimetallic nanoparticles along with Daptomycin showed enhanced antimicrobial activity against methicillin-resistant Staphylococcus and Micrococcus sp. INTRODUCTION: Noble metal nanoparticles have gained prominence in therapeutic and diagnostic applications 1. Many researchers have now devoted their efforts to the fabrication of bi-metallic nanocomposites like nano - alloys, core-shell and mixed metal nano-particles, owing to their valuable applications 2 - 3. Bimetallic nanoparticle synthesis involves simultaneous or sequential reduction of two metals resulting in to either core - shell or alloy form of nano-arrangement. Sequential reduction refers to the reduction of shell metal over the pre-formed seed of core metal. The formation of bimetallic nanoparticles depends on purity, non-reactivity and reducibility of the metal salts. 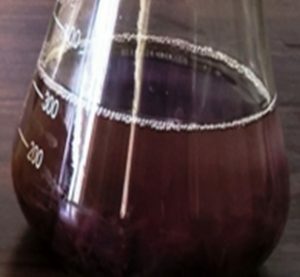 Previous literature has focused on the physical and the chemical synthesis of bimetallic nanoparticles like sol-gel method, sono-chemical method, micro - emulsion technique, aerosol technology, etc. Nucleation and transition phases of ions to nanoparticles need to be controlled especially in chemical synthesis 4 - 7. Zhang et al., have reported hollow Ag - Au bimetallic nanoparticles formed by galvanic replacement reaction 8. To overcome the drawbacks of the chemical and physical methods, biogenesis of bimetallic nanoparticles seems to be an eco-friendly and sustainable approach towards nanoparticle development. Biological sources of bimetallic salts reduction have been gaining tremendous attention as a viable alternative to the hazardous conventional techniques. Biological systems like bacteria, fungi, actinomycetes and plants have the ability to produce nanoparticles. Nanoparticles synthesized by microbes have gained popularity due to their innate potential, eco-friendly and stabilized nature 9 - 12. Fungi are reliable sources for large scale metal nanoparticle production as they offer less stringent handling, simple purification and feasible scale-up. Different fungal species have been reported to synthesize NPs either intracellularly or extra-cellularly. The Cell wall plays a vital role in intracellular nanoparticle formation. The negatively charged cell wall attracts the positively charged metal ions electrostatically and traps the ions 13. The physical parameters like temperature and pH influence the intracellular nanoparticle formation 14 - 15. Fungal synthesis of bimetallic nanoparticles is still less explored 16 - 17. These bimetallic NPs offer the versatility of combining the antimicrobial silver activity with the presence of gold, stabilized with biomolecules. 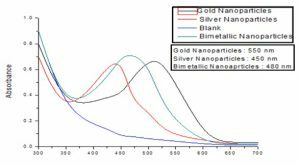 Bimetallic nanoparticles comprising of gold and silver have been reported to possess greater antimicrobial activity than monometallic ones 18 - 20. Ag-Au bimetallic nanoparticles were synthesized by a chemical method and assayed for their antibacterial activity against S. aureus 21. Ag-Au alloy nanoparticles antibacterial activity was increased when combined with penicillin G and piperacillin. Bimetallic Au-Ag nanoparticles were synthesized by using Ocimum basilicum aqueous leaf and flower extracts and revealed a high antibacterial activity against many pathogenic microorganisms 22. Our previous work was limited to the production of gold nanoparticles by different fungal species like Fusarium oxysoprum, Trichoderma reesei, Verticillium luteum, Aspergillus niger, Aspergillus versicolor etc. and their varied applications 23 - 25. We were now interested to utilize the potential of fungal strain for simultaneous bio-reduction of metal salts to form bimetallic nanoparticles. Therefore, the potential of Trichoderma reesei was used to form silver-gold bimetallic nanoparticles. Daptomycin, an anti-MRSA antibiotic which treats complicated skin and skin structure infections was combined with non-functionalized bimetallic nanoparticles which were biologically synthesized and are non-toxic 18 - 19. The antimicrobial activities of the Daptomycin, bimetallic nanoparticles and the combination of antibiotic and nanoparticles were then evaluated against methicillin-resistant S. aureus, S. epidermis and M. luteus strains. Thus, promising its potentiality for therapeutic purposes, especially; skin infection treatments in future endeavors. Growth of Microorganism: The microbial strain of Trichoderma reesei (NCIM 992) was obtained from National Collection of Industrial Microorganisms (NCIM), National Chemical Laboratory, Pune, India. 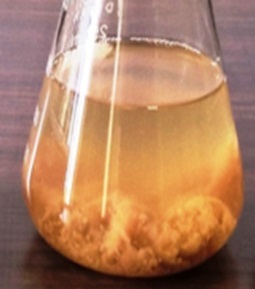 The microorganism was subcultured in modified mold growth medium containing (g/L): sucrose 20, sodium nitrate 3, yeast extract 1, peptone 1, dipotassium hydrogen phosphate 1, potassium chloride 0.5, ferrous sulphate 0.01 and magnesium sulphate 0.5. The strain was grown aerobically in 250 ml flasks in an incubator shaker at 200 rpm and 28 °C for 72 hours, and initial pH was maintained at 6.8 ± 0.2. The strain was then adapted to different concentrations of metal salts (0.05 mM to 1.5 mM) each of HAuCl4 and AgNO3 solution. The adaptation studies were conducted for continuous six months. The total cultivation time was reduced from seven days to five days and finally up to three days of incubation. Production of Bimetallic (Silver and Gold) Nanoparticles by Co-reduction: Under aseptic conditions, sufficient cell mass of Trichoderma reesei was separated and washed thrice with distilled water. 20 grams of wet biomass was taken and suspended in to a 500 ml Erlenmeyer flask containing 100 ml of each 10−3 M HAuCl4 and 10−3M AgNO3 solution. Above culture was incubated at 28 °C at 200 rpm for 2 days. For control, fungal biomass was suspended in distilled water and incubated at 28 °C at 200 rpm for two days. The amount of bimetallic nanoparticles produced was measured using ICP-MS.
Characterizations: The fabrication of bimetallic nanoparticles by Trichoderma reesei was analyzed by various analytical techniques. The fungal biomass without nanoparticles and with nanoparticles was centrifuged at 10,000 rpm for 15 minutes respectively. The obtained biomass was freeze dried at -54 °C, followed by lyophilisation. The lyophilised samples were placed on pin stubs and coated with gold under vacuum as they were non-conducting and examined by Scanning Electron Microscopy (SEM) on ZEISS: EVO18 equipped with an Energy Dispersive Spectrometer (EDS) on OXFORD INSTRUMENTS. Similarly, the samples were prepared for FTIR analysis. The samples were ground with KBr pellets and examined on Shimadzu FTIR-8400 in the range of 4000 - 400 cm-1. For XRD analysis, the sample was cast onto the glass slide and measurements were carried out using Rigaku Ultima IV instrument at the two-theta angle in the range of 20° to 80°. Antimicrobial Assay: To determine the antibacterial activity of synthesized gold nanoparticles, standard disk diffusion method was carried out against Multi Drug Resistant Strain (MRSA) Staphylococcus aureus. The agar plates having suitable nutrient media (LB media) was prepared, sterilized and allowed to solidify. After solidification, the agar plates were inoculated with bacterial cultures. 6 mm disks were impregnated with required quantity of antibiotic and nanoparticles in petri-plates containing suitable nutrient agar medium seeded with 120 μL of 36 h of each pathogen. 20 μg/ml (Minimum Inhibitory Concentration (MIC) of Daptomycin antibiotic, 20 μg/ml (equal amount as that of antibiotic) of nanoparticle and a mixture of both Daptomycin and lyophilized nanoparticle was formulated. 150 μl of each of these was impregnated on the corresponding disks and incubated at 28 °C for two days. The diameter of zones of inhibition was measured using a ruler and mean value was recorded for each pathogen and expressed in millimetre (mm). All the above experiments were carried out in duplicate. Nanoparticle Formation: The visual changes observed after the bioconversion of metal salts is depicted in Fig. 1 and it was noticed that the color varied for blank, gold chloride supplemented broth, silver nitrate supplemented broth and for the combination of both metal salts. 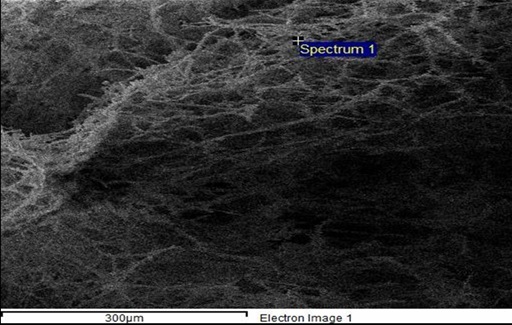 UV-Visible Spectroscopy studies of blank media revealed no characteristic peak near the 450 and 520 nm range indicating no extracellular synthesis (as per no change in media color). After two days, the biomass in the blank was white while it turned to yellowish color for silver nitrate supplemented broth. This indicated the formation of silver nanoparticles. Also, gold nanoparticles showed ruby-red color and the bimetallic nanoparticles showed dark purple color. The morphology of the cells and the metal salt concentration were two essential prerequisites for bimetallic nanoparticles formation. The optimum concentration of metal salts for the nanoparticles synthesis was found to be 1 mM (threshold level). Metal salt concentrations lesser than 1 mM did not give significant results and the cells died at concentrations beyond this level. Biomass supplemented with 1 mM of both metal salts showed color changes after 48 hours of incubation in dark conditions. The color change indicated the Nanoparticles’ formation. The bimetallic nano-particles produced were kept in the dark at 4 °C and even after one month, no major changes were observed (color or any physical appearance) making it stable 26 - 27. ICP-MS of the residual salts revealed that more than 75% of the metal salts were converted to nanoparticles as shown in Table 1. UV-Vis Spectroscopy: UV-Vis spectrum for Au, Ag and Au/Ag nanoparticles after separation and purification from the fungal biomass showed peaks at 550, 450 and 480 nm, respectively Fig. 2. SEM - EDS Analysis: Fig. 3 and 5, represent the SEM images of the fungal biomass samples before and after treating with metal salt solutions. The SEM instrument equipped with EDS studies were carried out for the composition analysis. EDS spectrum of fungal biomass samples before and after treating with Gold-Silver salt solutions are displayed in Fig. 4 and 6.
are bound to the nanoparticles which are acting as stabilizing agents. In Fig. 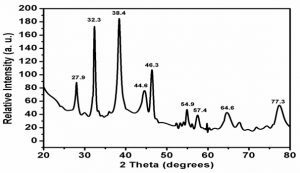 5, the existence of bimetallic nanoparticles as Ag-Au alloy was confirmed in the EDS spectrum at 1.5 - 3 keV. These results were used as a quick test to confirm the presence of bimetallic nanoparticles in the fungal biomass 28. Fourier Transform Infrared Spectroscopy (FTIR) Studies: FTIR measurements were carried out to identify the possible (protein) bio-molecules responsible for the capping and efficient stabilization of the metal nanoparticles synthesized by Trichoderma reesei. FTIR studies were conducted to determine the various chemical functional groups present in the sample containing the nanoparticles 17. FTIR spectra of untreated fungal biomass and fungal biomass supplemented with gold and silver metal salts were shown in Figure 7 and 8. 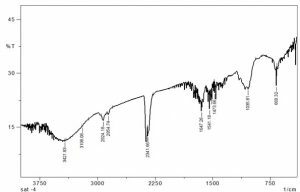 The IR peak shifts shown at 3421, 2854, 2341, 1659, 1473 and 1035 cm-1 indicated the changes in the functional groups. The peak shift from 1458 to 1473, an amide II region, is due to the -NH- bending vibrations from ketone to amine group. The shifting of peak to 1035 can be attributed to the amide bond of C-O stretching mode to N-O vibration mode indicating the presence of carboxylic group and amide groups in the material bound to the synthesized Ag-Au nanoparticles. The peaks at 2854 and 2341 can be attributed to the –C-H groups where the carbon is of sp3 hybridization and stretching of –O-H bond of carboxylic acids respectively. The band at 1659 cm-1, an amide I region, corresponds to carbonyl (–C=O) stretch in the proteins. This was further confirmed by band at 3421 cm-1. Similarly, Honery et al., 28 and Sandt et al., 29 pointed out similar chemical changes in functional groups resulting in nanoparticle formation in their FTIR studies. Further, the FTIR studies indicated that the secondary structure of the proteins was not affected because of their interaction with Ag-Au nanoparticles. The appearances of peaks in the amide regions were characteristic of proteins / enzymes that were found to be responsible for reduction of metal ions indicated the binding of nanoparticles with proteins. FTIR spectroscopy studies confirmed that the carbonyl group of amino acid residues and peptides of proteins has a stronger ability to bind the metal, so that the most proteins could most possibly form a coat covering the metal nanoparticles (i.e. capping) to prevent agglomeration of the particles and thus, the nanoparticles are stabilized in the medium 30 - 31. X-ray Diffraction Studies: Further the evidence for the formation of Gold Silver Bimetallic Nanoparticles was provided by the X-Ray Diffraction analysis. The crystalline nature of bi-metallic nanoparticles synthesized by Trichoderma reesei was determined by Bragg’s diffraction peaks evident from XRD pattern as shown in Fig. 9. 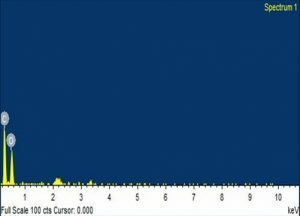 XRD pattern of bimetallic Ag-Au NPs, the Bragg’s reflection peaks at 2q values of 38.4° (111), 44.6° (200), 46.3° (200), 64.6° (220) and 77.3° (311) were observed. All these values showed the Face Centred Cubic (FCC) structure of the obtained nanoparticles having different lattice planes. 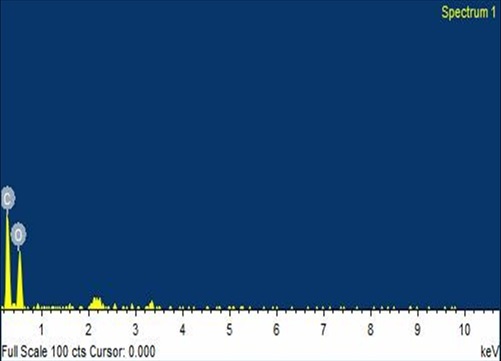 The Bragg’s peak positions in the spectrum and their intensities were compared with standard JCPDS files [JCPDS file nos 04-0783 and 01-1174, respectively]. 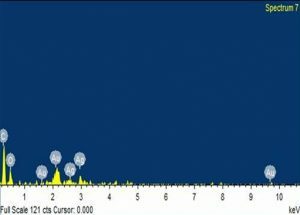 The fraction of the intensities of the (200), (220), (311) peaks were found to be much lower, suggesting 111 is the predominant orientation. 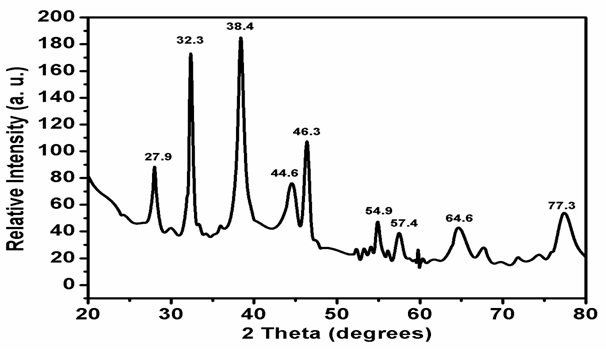 The remaining unidentified peaks in XRD pattern including a sharp peak at 27.9°, 54.9° and 57.4° can be attributed to the crystalline nature of capping and stabilizing proteins present over the surface of synthesized Gold-Silver bimetallic nanoparticles from Trichoderma reesei 32. Likewise, similar values of Bragg’s diffraction peaks for the Ag-Au bimetallic nanoparticles were reported by Sawle et al., Basavaraja et al., and Shankar et al., 33 - 36. Where K is a dimensionless shape factor with a value close to unity, l is the X ray wavelength in angstrom, β1/2 is the width of the XRD peak at half height and q is the Bragg’s angle. The calculated average particle sizes of the Au-Ag NPs were found to be 25 - 40 nm. Thus, the XRD pattern clearly shows that the Au-Ag NPs were formed by the reduction of metal ions and are in crystalline in nature. 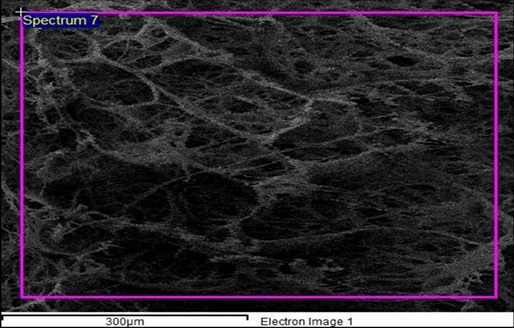 Transmission Electron Microscopy (TEM) Analysis: Transmission electron microscopy study shown in Fig. 10 confirmed that bimetallic silver-gold nanoparticles formed by Trichoderma reesei were ranged between 20 - 50 nm sizes which were in sync with the results of XRD. 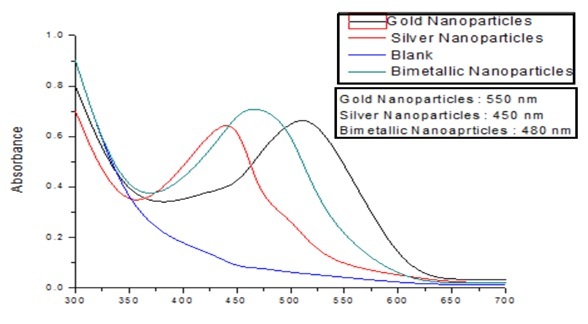 The homogeneity in nanoparticles was evident in case of bimetallic nanoparticles produced. No particular core-shell arrangement was seen for the silver-gold bimetallic nanoparticles. All the characterization results concluded alloy (mixtures of silver and gold nanoparticles in random configuration) sort of bimetallic nanoparticles. Antimicrobial Assay: Bimetallic nanoparticles have already proved their mettle as good antimicrobial compounds in previous studies, over the monometallic compounds 21 - 22. Now, the in vitro bactericidal activity of Daptomycin (antimicrobial agent for skin infections) was combined with bimetallic nanoparticles. This combined therapeutic agent was found to be more effective as compared to their respective free forms. Daptomycin combined with bimetallic nanoparticles and free Daptomycin were tested on bacterial strains by comparing the corresponding zone of inhibition (mm) as shown in Table 2. The process was non-toxic and eco-friendly. The combinatorial effect led to the higher binding affinity of the drug and enhanced antimicrobial efficacy. The antibiotic combined with bimetallic nanoparticles showed improved bactericidal activity than free form 37 - 40 of antibiotic. This was evident from the increased zone of inhibition of antibiotic combined with bimetallic nanoparticles. There was 37% increase in efficacy of Daptomycin due to the synergistic effect with bimetallic nanoparticles. The synergistic form of the drug prompted that the toxicity of high drug dosage can be mitigated in an economical way. CONCLUSION: In the present study, silver and gold bimetallic nanoparticles were synthesized using Trichoderma reesei. The synthesized nanoparticles were confirmed using SEM - EDS, and XRD and their stability was analyzed by FTIR. 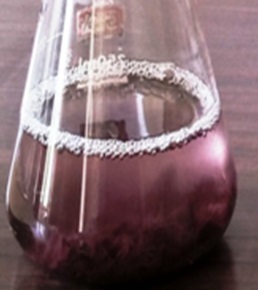 Production of bimetallic silver and gold nanoparticles were successfully achieved using Trichoderma reesei and the change of biomass color from colorless to dark purple within 48 hours of incubation period indicated it to be intracellular bimetallic nanoparticle synthesis. 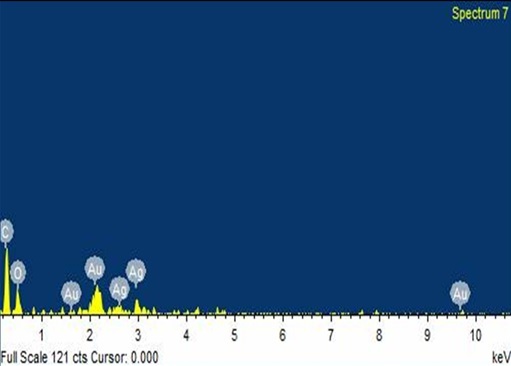 Characteristic peaks near the 420 nm - 540 nm range were revealed by UV-vis Spectroscopy studies indicating intracellular nanoparticle formation. No extracellular synthesis (as per no change in media color) was observed. The stabilization of the nanoparticles by the carbonyl group of amino acid residues and peptides of proteins was confirmed by the FTIR spectroscopy studies. The antimicrobial properties of the synthesized bimetallic nanoparticles in combination with antibiotic were found to be promising for treating infections caused by pathogenic bacteria. Though, the mechanism of action of this combinatorial drug is yet not deciphered. Future prospects of this work would involve extensive research on the exact mechanism involved and other relevant clinical applications. ACKNOWLEDGEMENT: The authors would like to thank the Central Instrumentation Facility Centre, IIT (BHU), Varanasi for SEM-EDS analysis and Department of Chemical Engineering and Technology for XRD analysis. 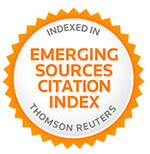 COMPETING INTEREST: The authors declare that have no competing interests. Rai M, Ingle AP, Birla S, Yadav A and Santos CA: Strategic role of selected noble metal nanoparticles in medicine. Critical reviews in microbiology 2016; 42(5): 696-719. Feng L, Gao G, Huang P, Wang K, Wang X, Luo T and Zhang C: Optical properties and catalytic activity of bimetallic gold-silver nanoparticles. Nano Biomedicine and Engineering 2010; 2(4): 258-67. Roopan SM, Surendra TV, Elango G and Kumar SH: Biosynthetic trends and future aspects of bimetallic nanoparticles and its medicinal applications. Applied microbiology and biotechnology 2014; 8(12): 5289-300. 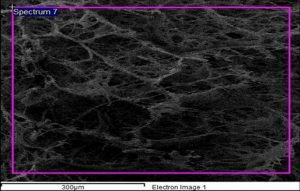 Wang C, Chi M, Li D, Strmcnik D, Van der Vliet D, Wang G, Komanicky V, Chang KC, Paulikas AP, Tripkovic D and Pearson J: Design and synthesis of bimetallic electrocatalyst with multilayered Pt-skin surfaces. Journal of the American Chemical Society 2011; 133(36): 14396-403. Gümeci C, Cearnaigh DU, Casadonte DJ and Korzeniewski C: Synthesis of PtCu 3 bimetallic nanoparticles as oxygen reduction catalysts via a sonochemical method. Journal of Materials Chemistry A 2013; 1(6): 2322-30. Chen DH and Chen CJ: Formation and characterization of Au–Ag bimetallic nanoparticles in water-in-oil micro-emulsions. Journal of Materials Chemistry 2002; 12(5): 1557-62. Byeon JH and Kim YW: An aerosol-seed-assisted hybrid chemical route to synthesize anisotropic bimetallic nanoparticles. Nanoscale 2012; 4(21): 6726-9. Zhang X, Zhang G, Zhang B and Su Z: Synthesis of hollow Ag–Au bimetallic nanoparticles in polyelectrolyte multilayers. Langmuir 2013; 29(22): 6722-7. Abdel Hamid AA, Al-Ghobashy MA, Fawzy M, Mohamed MB and Abdel-Mottaleb MM: Phytosynthesis of Au, Ag, and Au–Ag bimetallic nanoparticles using aqueous extract of sago pondweed (Potamogeton pectinatus). ACS Sustainable Chemistry & Engineering 2013; 1(12): 1520-9. Tamuly C, Hazarika M, Borah SC, Das MR and Boruah MP: In situ biosynthesis of Ag, Au and bimetallic nanoparticles using Piper pedicellatum DC: green chemistry approach. Colloids and Surfaces B: Biointerfaces 2013; 102: 627-34. Salunke GR, Ghosh S, Kumar RS, Khade S, Vashisth P, Kale T, Chopade S, Pruthi V, Kundu G, Bellare JR and Chopade BA: Rapid efficient synthesis and characterization of silver, gold, and bimetallic nanoparticles from the medicinal plant Plumbago zeylanica and their application in biofilm control. 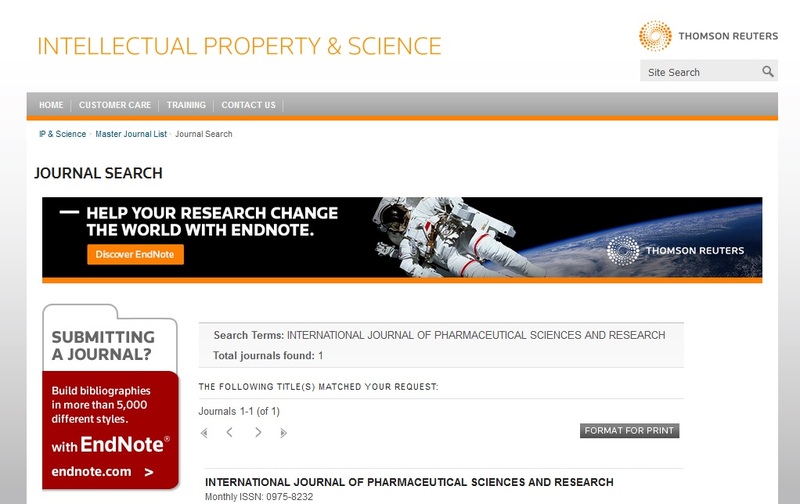 International journal of nanomedicine 2014; 9: 2635. Garcia AG, Lopes PP, Gomes JF, Pires C, Ferreira EB, Lucena RG, Gasparotto LH and Tremiliosi-Filho G: Eco-friendly synthesis of bimetallic Au Ag nanoparticles. New Journal of Chemistry 2014; 38(7): 2865-73. Durán N, Marcato PD, Durán M, Yadav A, Gade A and Rai M: Mechanistic aspects in the biogenic synthesis of extracellular metal nanoparticles by peptides, bacteria, fungi, and plants. Applied microbiology and biotechnology 2011; 90(5): 1609-24. Liu H, Zhang H, Wang J and Wei J: Effect of temperature on the size of biosynthesized silver nanoparticle: deep insight into microscopic kinetics analysis. Arabian Journal of Chemistry 2017; 9(4): 14. Chitra K and Annadurai G: Antibacterial activity of pH-dependent biosynthesized silver nanoparticles against clinical pathogen. BioMed research international 2014; 20(12): 101-105. Roopan SM, Surendra TV, Elango G and Kumar SH: Biosynthetic trends and future aspects of bimetallic nanoparticles and its medicinal applications. Applied microbiology and biotechnology 2014; 98(12): 5289-300. Tripathi RM, Gupta RK, Bhadwal AS, Singh P, Shrivastav A and Shrivastav BR: Fungal biomolecules assisted biosynthesis of Au–Ag alloy nanoparticles and evaluation of their catalytic property. IET Nanobiotechnology 2015; 9(4): 178-83. Ramakritinan CM, Kaarunya E, Shankar S and Kumaraguru AK. Antibacterial effects of Ag, Au and bimetallic (Ag-Au) nanoparticles synthesized from red algae. InSolid State Phenomena 2013; 201: 211-230. Ranga Reddy P, Varaprasad K, Narayana Reddy N, Mohana Raju K and Reddy NS: Fabrication of Au and Ag Bi-metallic nanocomposite for antimicrobial applications. Journal of Applied Polymer Science 2012; 125(2): 1357-62. Ghosh S, Jagtap S, More P, Shete UJ, Maheshwari NO, Rao SJ, Kitture R, Kale S, Bellare J, Patil S and Pal JK: Dioscorea bulbifera mediated synthesis of novel Au core Ag shell nanoparticles with potent antibiofilm and antileishmanial activity. Journal of Nanomaterials 2015; 16(1): 161. Bahrami K, Nazari P, Nabavi M, Golkar M, Almasirad A and Shahverdi AR. Hydroxyl capped silver-gold alloy nanoparticles: characterization and their combination effect with different antibiotics against Staphylococcus aureus. Nanomedicine Journal 2014; 1(3): 155-61. Malapermal V, Mbatha JN, Gengan RM, Anand K: Biosynthesis of bimetallic Au-Ag nanoparticles using Ocimum basilicum (L.) with antidiabetic and antimicrobial properties. Advanced Materials Letters. 2015; 6(12): 1050-7. Karmakar S, Kundu S and Kundu K: Bioconversion of silver salt into silver nanoparticles using different microorganisms. Artificial Cells, Blood Substitutes, and Biotechnology. 2010; 38(5): 259-66. Chakravarty I, Pradeepam JR, Kundu K, Singh KP and Kundu S: Mycofabrication of Gold Nanoparticles and Evaluation of Their Antioxidant Activities. Current pharmaceutical biotechnology 2015; 16(8): 747-55. Shankar SS, Rai A, Ahmad A and Sastry M: Rapid synthesis of Au, Ag, and bimetallic Au core–Ag shell nanoparticles using Neem (Azadirachta indica) leaf broth. Journal of colloid and interface science 2004; 275(2): 496-502. Shedbalkar U, Singh R, Wadhwani S, Gaidhani S and Chopade BA: Microbial synthesis of gold nanoparticles: current status and future prospects. Advances in colloid and interface science 2014; 209: 40-8. Westsson E and Koper GJ: How to determine the core-shell nature in bimetallic catalyst particles? Catalysts 2014; 4(4): 375-96. Honary S, Gharaei-Fathabad E, Paji ZK and Eslamifar M: A novel biological synthesis of gold nanoparticle by Entero bacteriaceae Tropical Journal of Pharmaceutical Research 2012; 11(6): 887-91. Sandt C, Madoulet C, Kohler A, Allouch P, De Champs C, Manfait M and Sockalingum GD: FT-IR micro-spectroscopy for early identification of some clinically relevant pathogens. Journal of applied microbiology 2006; 101(4): 785-97. Mukherjee, Roy M, Mandal BP, Dey GK, Mukherjee PK, Ghatak J, Tyagi AK and Kale SP: Green synthesis of highly stabilized nanocrystalline silver particles by a non-pathogenic and agriculturally important fungus asperellum. Nanotechnology 2008; 19(7): 75-103. Sawle BD, Salimath B, Deshpande R, Bedre MD, Prabhakar BK and Venkataraman A: Biosynthesis and stabilization of Au and Au–Ag alloy nanoparticles by fungus, Fusarium semitectum. Science and technology of advanced materials 2008; 9(3): 350-12. Basavaraja S, Balaji SD, Lagashetty A, Rajasab AH and Venkataraman A: Extracellular biosynthesis of silver nanoparticles using the fungus Fusarium semitectum. Materials Research Bulletin 2008; 43(5): 1164-70. Shankar SS, Ahmad A, Pasricha R and Sastry M: Bioreduction of chloroaurate ions by geranium leaves and its endophytic fungus yields gold nanoparticles of different shapes. Journal of Materials Chemistry 2003; 13(7): 1822-6. Zheng K, Setyawati MI, Lim TP, Leong DT and Xie J: Antimicrobial cluster bombs: silver nanoclusters packed with Daptomycin. ACS nano 2016; 10(8): 7934-42. Verma S, Abirami S and Mahalakshmi V: Anticancer and antibacterial activity of silver nanoparticles biosynthesized by Penicillium spp. and its synergistic effect with antibiotics. Journal of Microbiology and Biotechnology Research 2017; 3(3): 54-71. Yallappa S, Manjanna J and Dhananjaya BL: Phytosynthesis of stable Au, Ag and Au–Ag alloy nanoparticles using sambac leaves extract, and their enhanced antimicrobial activity in presence of organic antimicrobials. Spectrochimica Acta Part A: Molecular and Biomolecular Spectroscopy 2015; 137: 236-43. Roshmi T, Soumya KR, Jyothis M and Radhakrishnan EK: Effect of biofabricated gold nanoparticle-based antibiotic conjugates on minimum inhibitory concentration of bacterial isolates of clinical origin. Gold Bulletin 2015; 48(2): 63-71. Chakravarty I, Narasimha P, Singh S, Kundu K, Singh P and Kundu S: Synergistic oligodynamic effect of mycogenic bimetallic nanoparticles with daptomycin for controlling pathogens. Int J Pharm Sci Res 2018; 9(5): 1788-96.doi: 10.13040/IJPSR.0975-8232.9(5).1788-96.